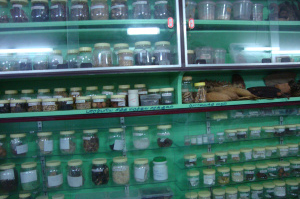 Hundreds of Research Projects on Tamil language and culture funded by various international, national and state organizations such as UGU, CSIR, ICHR, ASI, INSA, ICSSR, NISTADS, CICT, Ford Foundation and CIIL, in addition to the support from the Government of Tamil Nadu, have been completed. 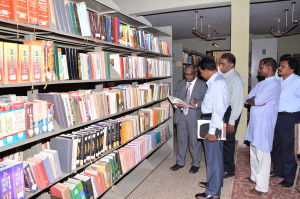 Tamil University adopts strict standards in research, since higher level research is its thrust area. The teachers maintain strict control over the research writing. Misconduct in research is an act of breaching scholarly honesty. It is viewed seriously at Tamil University which may lead to termination of the candidate from the programme or other formal action including legal action. Fabrication of data: proclamation of a non- existing study results. Falsification: alteration of existing data. Misleading authorship: attributing to those who did not contribute in the research and inappropriate acknowledgement of work produced by those involved in research. A candidate involved in misconduct of research will be dealt with according to the Rules and Regulations of The Tamil University. The University-Industry Linkage programme of the UGC was implemented in Tamil University in 2013-14. 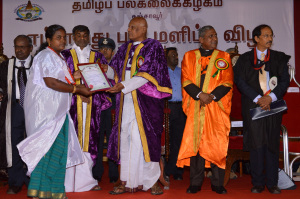 Kamarajar University; Dr.M. Jayakumar, Prof. of Extension, Bharathiar University Coimbatore, and the Heads of the Departments of Tamil University on March 09, 2014. Several suggestions were made for the implementation of this programme in Tamil University. A few of the activities suggested are listed below. Creation of a Technology Park in the Tamil University. Organization of an exhibition on science and technology. Offering short-term training modules on cultural heritage to the students of local colleges on various subjects at Tamil University, using the expertise of the Tamil University’s Faculty Members. Tamil University, Thanjavur. Efforts are on to implement these suggestions. lectures and to provide training, utilizing the facilities of IICPT laboratory to the participants. Empowering students from rural and Poor Socio-economic Background, and Focus on Education through Mother Tongue Hundreds of PhDs, Hundreds of M.Phil. Graduates, Thousands of Post-Graduates, Students of Tamil University. Training Programmes on Tamil Language and Culture for Scholars and Students from Malaysia and Singapore.